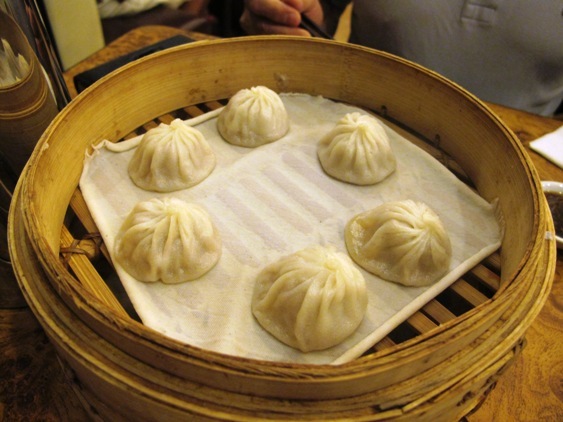 I have made my love for Xiao Long Bao known on this blog. And until Din Tai Fung arrives here in Manila, I had to make do with Crystal Jade. That was, until Shi Lin came along. I first read about Shi Lin in Chuvaness, then read about it again in Desserts Come First. Both bloggers gave the food glowing reviews, so I was excited to try it out, to see for myself if the Xiao Long Bao is, indeed, close to Din Tai Fung’s. So last Saturday, I dragged my whole family to the Podium to try Shi Lin, finally. I was paying, so I had first choice as to where we were eating. We arrived at a little past 7:30 pm, and were second on the waiting list. The restaurant looks tiny from the door, but it’s in one of those oddly shaped spaces in the Podium that curves to an L-shape out of sight. And the food comes out pretty quickly, so the wait shouldn’t be too long, unless you’re a ridiculous # 14 on the waitlist or something like that. As with Crystal Jade, though, you need to keep watch that no one just walks through the door and takes the table meant for you (as my sister said, “What is this, a McDonalds?”). A woman stole our table, and she better thank her lucky stars that a couple of tables were freed up at the same time, or there would’ve been hell to pay. I don’t understand people who cut in line, whether it be in a restaurant, or the queue for taxis or the MRT. But enough harping about bi***es who don’t know how to wait their turn. Let’s get to the million dollar question. How does Shi Lin’s Xiao Long Bao compare to Din Tai Fung’s and, as its direct local competition, to Crystal Jade’s? While I sang praises of CJ’s, Shi Lin wins it for me. The broth tastes lighter, cleaner and does not have the slight aftertaste that Crystal Jade’s had. 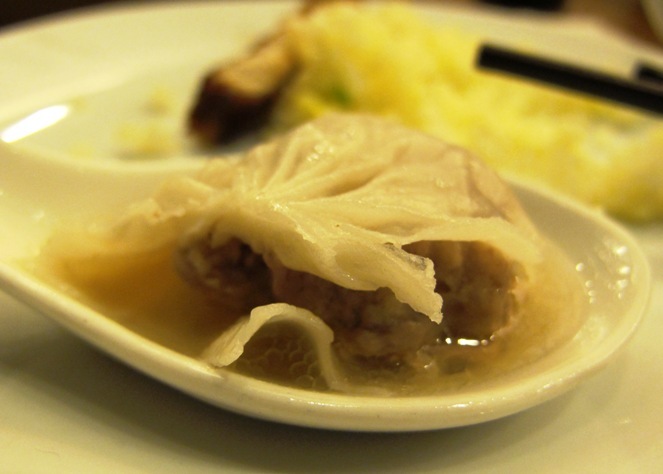 The dumpling wrappers are also much closer to the standard of thinness and consistency that DTF has set. But the ultimate test, of course, is how close they are to Din Tai Fung’s? I am extremely delighted to report that these are as close to Din Tai Fung as you can get without actually going to Din Tai Fung. The broth, as I already mentioned is light, clean and filled with the flavor of the pork. The pork is tender and the wrappings thin and delicate. Shi Lin also lets you blend your own dipping sauce of ginger strips, black vinegar and soy sauce (Crystal Jade gives you the dipping sauce ready-made). 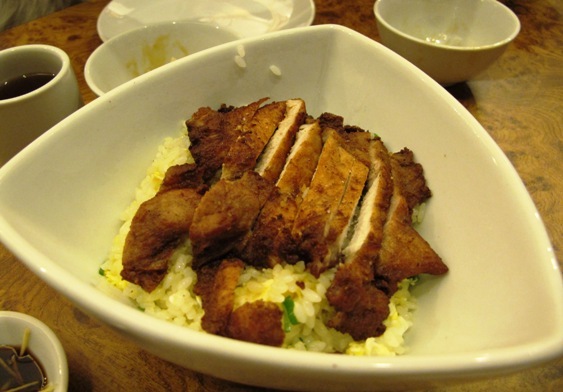 We also ordered the pork chop rice. The rice was lovely. The pork chop had similar flavors to Din Tai Fung’s but falls disappointingly short of expectations. Compared to DTF’s flavorful version, Shi Lin’s is rather bland. Maybe they should go heavier with the seasoning? On the other hand, I was definitely NOT disappointed with Shi Lin’s taro dumplings. These piping hot bundles of sticky goodness were as delicious as I remember them from Din Tai Fung. I daresay even yummier than DTF Singapore’s. No picture though, because the dumplings were gone the moment they landed on the table. But even if the taro dumplings were a bust, I would’ve been happy. I have found a worthy alternative to Din Tai Fung to tide me over until the time the king of Xiao Long Bao finally comes to our shores. Shi Lin is located at the 3rd floor of The Podium.